The Angels took the Joe Cronin League in a dominant performance in 2014. The Angels' .704 winning percentage was the highest ever in the Joe Cronin, the Chub Feeney or either Bud Selig League. The Angels won it by 10 games over the defending champions, the Cleveland Indians. The Angels came from almost nowhere to win the Joe Cronin League in a romp in 2014. In four previous seasons, the Angels never finished within five games of the Joe Cronin League lead. But they cruised in 2014 to a 50-21 record. Their .704 winning percentage was the highest ever in the Joe Cronin, Chub Feeney or Bud Selig Leagues. The Angels finished 10 games ahead of the Cleveland Indians, who were defending their 2013 Joe Cronin championship. The Texas Rangers, who finished only three games behind the Indians in the 2012 Joe Cronin standings, fell all the way to last place in 2014, 22 1/2 games behind the Angels. 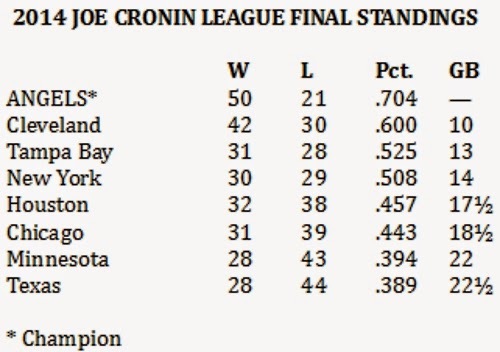 Finishing 29 games over .500 in the Joe Cronin League, the Angels built about half of that cushion against their Joe Cronin competition from the American League Central, hitting a combined 17-3 against the Indians, Chicago White Sox and Minnesota Twins.